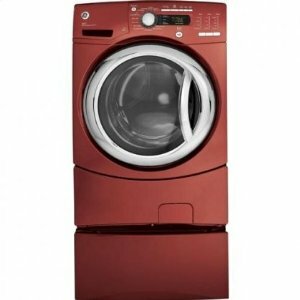 GE GFWS3505LMV Vermilion Red Frontload Washer 4.9 cu. ft. The GFWS3505LMV is a washer produced by GE with a vermilion red exterior. Its features include steam functions, which are preferred by users because of their gentle action. Steam Refresh uses steam action to give laundered items a fresh smell and a wrinkle-free appearance. On the other hand, Steam Assist dissolves hard to remove stains by gently seeping into the fabric of soiled items. The machine has a CEE Tier III rating and qualified for Energy Star which means it adheres to federal standards on energy efficiency. You can be assured of a performing washer without having to spend a lot on energy. eWash option, allows you to save on energy by having select cycles use cold water instead of warm or hot water. You need not worry about the outcome, because the cold water cycles still produce scrupulously cleaned clothes. To maintain a peaceful environment even as you wash your clothes, the washer has a Adaptive Vibration Control or AVC mechanism. With this built-in feature, the washer’s spin patterns are adjusted so that it produces less noise and vibrations. Thus, you can install this machine anywhere and do laundry anytime without having to worry if your washer makes too much noise that can disturb anyone at home or your neighbors. The control panel of this model are located at the upper portion of the machine’s front side, just above the door. There are rotary and electronic controls included, such as the LED cycle countdown and LED cycle status lights that let you know if a cycle you have chosen is already done. There is also end-of-cycle signal with an adjustable volume and a delay start of up to 24 hours, to let you start on your laundry even if you’re not physically there to operate the machine. Another control panel option is the Child Lock feature that prevents accidents from happening especially when there are children near the machine. The vermilion red color of the washer give life to any room it will be installed in. The 12 built-in wash cycles in this model include Washable Wools, Speed Wash, Drain and Spin, Active Wear,2nd Rinse, PreWash and Stain Wash, which take into consideration the type of load you may put in for cleaning and your preference (example, using Speed Wash if you need to wash something in a hurry). The Timed Flow-Thru dispenser mechanism for this model includes any kind of washing implement, including pre-treat solution, fabric softener, bleach and liquid or powder detergent. You are ensured that the dispensing of these implements are of the right amount and at the right time in a cycle. There are 5 (including Sanitize) wash and rinse temperatures included in this washer, which should be enough options for users who would like to make match the water temperature used for some delicate items. This particular model is priced higher compared to other washer models with more or less the dame features.